The Ritz Cinema in Chapel Street opened it’s doors in February 1938 and remained the centre of entertainment in Billericay until 1971. The onslaught of television had dwindled audiences to a level where the building was not sustainable as a Cinema and so like many of the cinemas in nearby towns it became a Bingo Hall. As the popularity of Bingo waned the building transformed itself again into a Snooker Hall, but the writing was on the wall. Planning applications were put in for redevelopment, first of all for an office block and later for residential flats. Sadly the building was pulled down around the turn of the century and a popular rendevous in the town was gone forever. I remember going to the Ritz in 1960 with my first date. He turned up in wellies as it was a very wet night. I thought no one would see in the dark. Imagine my horror when he jumped over the front seat to get an ice cream when the lights went on at half time. His turned over wellies were seen by everyone. End of romance. I can remember as a teenager watching many movies at the Ritz, but the thing that sticks in my mine most was that sometimes part way through the movie a couple of birds would fly through the hole in the ceiling and fly around in the cinema no doubt attracted by the light. I spent a lot of my youth at the Ritz cinema. Saturday afternoon was 6d a ticket in the late 50s/60s always with a dreadful B movie before the main film. A crowd of us would queue to get in every week and afterwards would go to Goodspeeds to get a bag of chips to eat on the way home. Often we would play ‘knock down ginger’ as we ran the length of Chapel Street. I only ever made two visits to the Palace Cinema in Billericay. Once in about 1959 with a nurse from the hospital and again, this time with my wife on 1967, to see ‘Those Magnificent Men in Their Flying Machines’. In 1960 we had just moved into our new home. We visited the Ritz cinema in Chapel St., to see Marilyn Munro in ‘Some Like It Hot’. Billericay cinema was popular because otherwise it was a train trip to Brentwood or Romford or go to Chelmsford or Laindon (later Basildon). 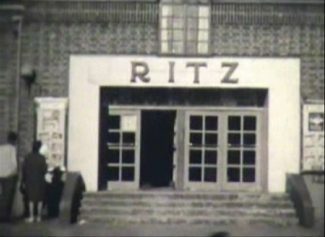 In later years just before its closure as a cinema The Ritz was owned by Basildon Council Chairman Bert Phelps who also owned the Radion in Laindon so films tended to go from one cinema to the other The brochure and poster showed what was on at both cinemas for the current week and the following week. The films changed to different one on a Thursday. The Ritz also had a car park and in the early days of buses this was used by City Coaches of Wood Green and Brentwood as a layover/terminus for services in Billericay also the mobile surgery of PDSA (Peoples Dispensary for Sick Animals) would come to the Ritz car park once a week. The Cinema became a Bingo hall when it was acquired by Brentwood Football Club.